In this day and age news travels faster than it can be produced. You can literally become famous overnight. The internet has become the great equalizer. Everybody can be somebody, and everybody has a voice. With the population of this planet as it is, there are a lot of voices out there and almost as many places for them to speak up. As a business it is important to listen to these voices, but it is impossible to go to, or even know, all the places where someone has something to say about your business. Fortunately, there are several websites, which cater towards the need to rant and rave. Gunk Haus is also up for vote to be included in Zagat's. If you haven't voted for us yet, please take a moment to do so. It's been a long time since I posted, and I miss it. There is so much I want to write about running a restaurant, and in due time I will be back. 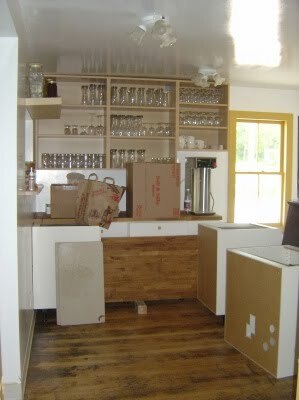 The walk-in is almost done, and soon there will be taps flowing as well. 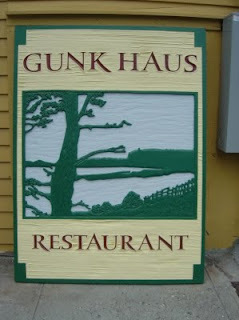 This post is actually not intended for you my loyal readers, but for the search engines on the interwebbens, because it has come to my attention that some guests couldn't find Gunk Haus due to misspelling. 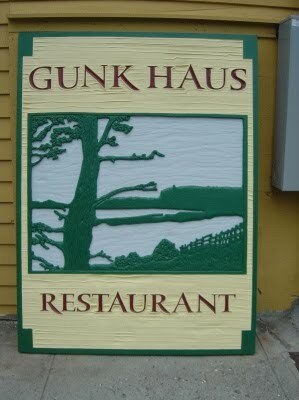 Dear search engines, our restaurant is spelled Gunk Haus, NOT Gunk Hause, Gunk House, Gunks Haus, Gunks Hause, Gunks House, Gunx Haus, Gunx Hause, or Gunx House (but if you please take all these names and make them point to us nevertheless, we would really appreciate it). Again I stand in front of you, asking you for your participation. When we applied for our liquor license, we went for the whole shebang: beer, wine, and hard liquor. So far we have only served beer and wine, but we are thinking about slowly adding hard liquor and mix drinks. So here is the question I put in front of you: What is your mix drink? As always, thank you for your participation. 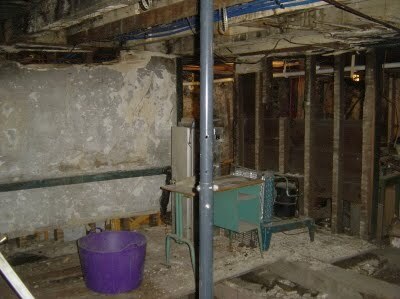 The other day (more than a month ago), I told you about installing a walk-in cooler in the basement. Shortly thereafter I looked over the panels of the walk-in we had bought a long while back, and noticed that there was a panel missing, or so I thought at that time (today I know better). 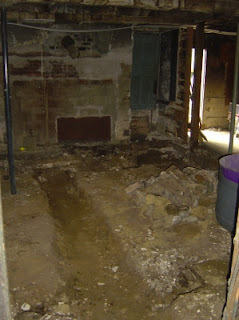 That's when I decided to do what I always had in mind: Build a custom walk-in, which is much larger than what we have, and it will fit into the basement like a glove (after some excavating and such, but you'll see for yourself in a second). 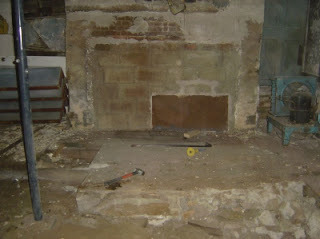 ... with the food being prepared in this now defunct fireplace. The first task was to remove the concrete in front of the fireplace. Next there has to be a trench. I love digging trenches, I'm good at it, shallow trenches, deep trenches, I do it all. This one is more on the shallow side, and it is meant for a footing on which the walk-in walls will rest on. This may sound like overkill, but I want to do it right the first time around. 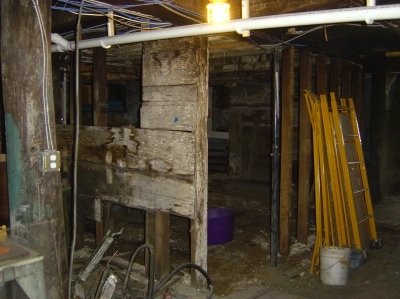 Plus, the other functionality the walk-in, or its walls, has is to support the floor above, not that it is in danger of collapsing, but due to the long floor joists it is quite bouncy. I am almost done with the digging, and here you can see the beginning of the footing form. 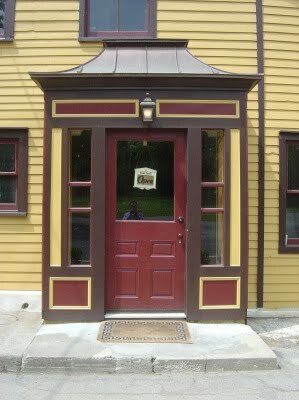 It will be a spectacular walk-in, not least because of the door, which we got from our friends at TuthillHouse At The Mill. I have never owned a restaurant before, never worked in one either. Heck, the closest I ever got to restaurants was from a customer perspective. For those of you who don't know it, I am a computer geek, I have been since age 15 when I got my first computer (a Sinclair ZX-81 with a whopping 16KB, that's K like in Kilo!!!). The interest in all things computers eventually led to a Masters Degree in Computer Science. Flash-forward: It is July 10, 2010. I own a restaurant where I am responsible for the front-of-the-house (restaurant lingo for the staff that you see running around, as opposed to back-of-the-house, which are the people who actually prepare your food, clean your dishes, etc.). Today we were one server short, and I couldn't find anyone to cover the shift, and that on a Saturday night, when we were destined to get busy. To make it short, we decided to call up E! 's sister to play the hostess-with-the-mostess (thank you Amy), so that I could be out on the floor waiting tables. I was admittedly nervous, as I usually am when I do something I haven't done before, but I also knew that this was a great opportunity to walk in my staffs' shoes, and do the things I preach them to do. We had a busy night, but it was a steady flow instead of a mad rush, and that made it easier. I let my two servers wait the tables, keeping an eye on the floor to ensure our guests were tended to in a timely manner, bused tables to take the load of the servers and have them concentrate on our guests. All this went very well until a party of eight arrived. Larger parties always pose a challenge to wait staff and kitchen alike, taking orders and getting the food out all at once requires more time and ties up the server and kitchen. That is when I heard my calling: This table was mine! The party arrived in two groups about five minutes apart, which gave me time to prepare: Mark up the guest check with seat numbers, so that I could remember which guest is getting or had what to eat and drink, get water glasses out, make sure there is enough silverware on the table. Although I thought I was prepared, I instantly failed to write down drink orders by guest, which meant I had to go back later and peek at the table to figure out who had ordered what drink. I avoided that mistake when taking food orders, and didn't have any problems that the table ordered food in reverse order of my seat numbering. When the food came out, every guest got exactly what they ordered, without having to ask around who ordered what (it's these little details that make the difference when serving guests). I continued keeping an eye on the table, refilling water glasses, removing empty plates, taking beverage orders, while making sure the rest of the dining room was taken care of by my two servers. After my table had finished their entrees I offered desserts and got an order for three Schatzies. I placed the order with the kitchen and started tallying up the bill so I had the check ready when the guests had finished their desserts. We don't have a POS (point of sale) system yet, which puts some strain on our wait staff, as they have to manually add up the numbers for guests checks. I hope to change this soon, but it all takes time. Baby steps, baby steps. Fully prepared I went to the table asked if they wanted anything, and when they declined whipped out the check. Splitting the bill five-ways (four credit cards and cash) was not a problem. After the guests had left and the table was cleared I felt very satisfied: My first waiting experience, and I think I did a pretty good job. I would rate myself at a C+, because I made quite a few mistakes, which I would criticize my staff for, but I am learning, fast, very fast. Yesterday evening we had a mother with her teenage son for dinner, and they had Schatzies for dessert. 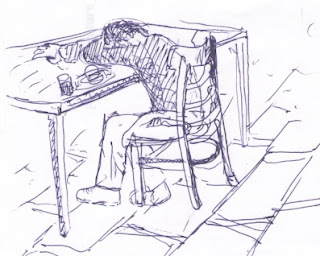 Schatzies are addictive, and the son wanted to get some to go, but his mother declined, which clearly must have bummed him out, because after they left, our waitress found this drawing on their table. For those of you who haven't been to Gunk Haus yet, Schatzies are bite-size chocolate-filled pretzels, and they are highly addictive. The name was coined one evening when we had our neighbor Billiam (of Liberty View Farm) and his friend Helen (the associate publisher of edible Hudson Valley) for dinner, and they got to try Schatzies for the first time. The ensuing naming discussion finally settled on Schatzies, and that's what they're called now. Update: Google has meanwhile fixed the problem, which is why below map does not display the problem anymore. Google is omnipresent in my internet life. My browser home page is Google, this blog site is owned by Google, I use Google Docs, and various other nifty applications Google offers, for free. I love Google, and I think it's the best thing that happened to the internet world since the start of the World Wide Web. However, right now I have a problem with Google: It is losing us money! The problem is that Google Maps is a widely used application to locate places and get directions (I use it all the time), but it has our location wrong, by a whopping four miles!!! Here is a map of where Gunk Haus is (marker A) and where Google thinks it is (marker B). This is a big deal to us! I have heard from several people already that they couldn't find us, because they looked us up on Google Maps, but you can assume the number of people who don't tell us is substantially larger. Of course Google allows you to notify them of a problem, and I did so twice already, and I was told twice that I am right, but being right doesn't bring guests to our restaurant. The next complaint I have is with Facebook, which I also use extensively. Initially I had posted our address there, but then I found out that they turn the address into, wait for it, a Google Maps link. I can assure you, we are pretty upset about this, and the thought of legal action has crossed my mind, just to get someone's attention (Google doesn't have live customer service, because it costs money; gee, tell me about it, I have wait staff taking orders and delivering food, being there for our guests if things aren't right). 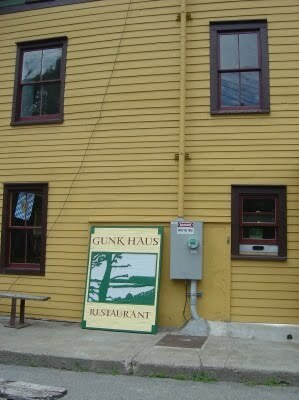 Gunk Haus is closed on Tuesdays. Originally we thought about closing on Mondays, but reconsidered, because there are too many holidays on Mondays for which we would have been open, and possibly confused our customers. Anyhow, Gunk Haus is closed on Tuesdays. All this means to us is that there are less people around, but the work continues. This morning our friend, and logo designer, and sign maker Jerry (of Starpoli Signs fame) dropped off the sign for our building, and it looks fantastic!!! Later in the afternoon Jack, our Jack of all trades, came by and we talked about how and where to hang the sign (amongst other things, like building a custom walk-in cooler in the basement, and turning the basement underneath the beer hall into a prep kitchen). I went to pick up more wine at Whitecliff Winery this morning, and on the way back stopped by at Jerry's to pick up the other sign, that will adorn our building. 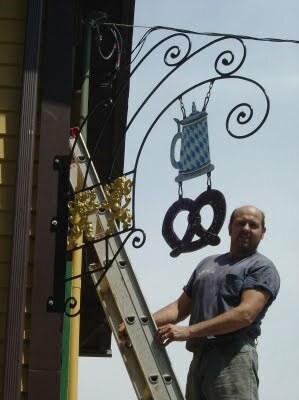 Unfortunately, the stein and pretzel, which will hang off the bracket, aren't done yet, but maybe by Saturday, when Jack and I are planning to hang it. This morning I received the new part for the dishwasher, which now works again. Paaaaarty!!! Yesterday was Father's Day, and without surprise we had a nice crowd. From the early afternoon to almost 9pm we had Dads and their families walk through the door. One of our guests was Agnes of The Village Tearoom (Facebook page) and her family. E! 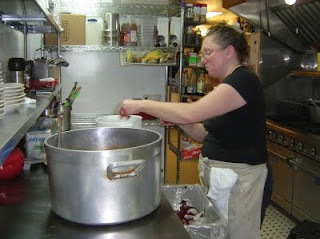 had worked at The Tearoom as the daytime cook for almost a year, before we bought Gunk Haus, and learned most likely more than during her year at The Culinary Institute of America. Cooking to order requires continuous planning and scheduling, so that meals for one table are ready at the same time, and this is a skill that can't be taught in a classroom, but has to be practiced. The evening went smooth with one exception: Our dishwasher broke. It doesn't drain the water anymore, most likely because the drain pump is broken. Kudos to our human dishwasher Rob, who pulled through, doing the dishes the old fashion way. Our walk-in cooler has been sitting in our basement for a year and a half now, nicely stacked. 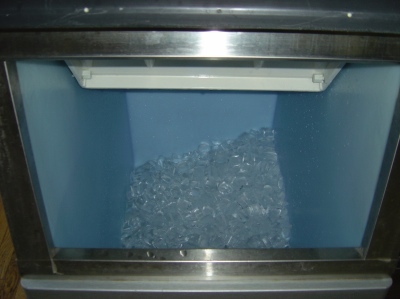 We bought it for our beer draft system, and to serve as additional produce cooler. Most prefab walk-ins are seven or eight feet high, which is why I haven't installed it yet: The space in the basement where it will live is not high enough. 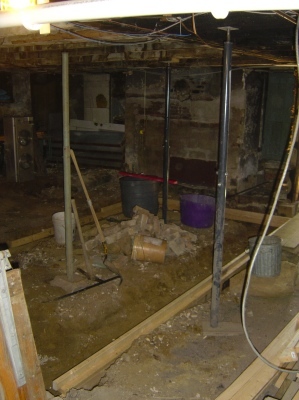 In the olden days, the basement of Gunk Haus seems to have been occupied by a kitchen. The kitchen floor was installed on top of wooden beams, which sat on top of rocks and dirt. 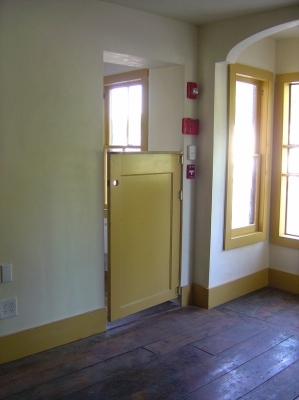 Without the floor, the walk-in should just about fit. So yesterday I started removing the old flooring, and while I was at it, did some general cleanup in the basement. I meant to continue today, but E! 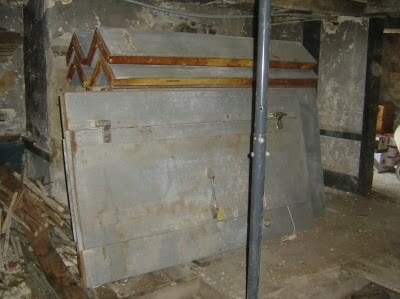 had noticed a sewery smell in another part of the basement, which was once the home to four tenants. A while back I had ripped out the shower in what used to be the bathroom, to make space for our washing machine. 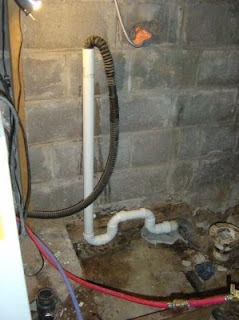 To make it short, I ripped out the remaining fixtures and the flooring to get to the drain pipes, and lo and behold, the drain pipe from the washing machine had a loose connection, releasing water and sewer gases. Not anymore. 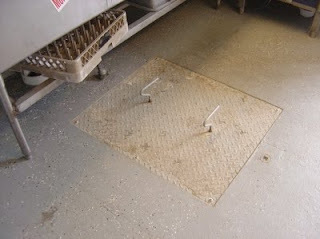 And while I was at it, I replaced an existing S-trap with a better P-trap. It was a stunning weekend. Friday, Saturday, and Sunday we had large crowds for dinner and lunch. We had so many people come through the door, that E! had to ration hamburgers, to save some for Sunday. Today's menu is brief, very brief. Fortunately, we're closed tomorrow, giving us a breather, and time to restock our fridges. So, why didn't we get more supplies upfront? Well, stocking up a restaurant is like investing in the stock market: You look at past performance, look at future prospects and influencing factors, and take a stab at it. Beyond that, it's anyone's guess. Today is slow, which isn't surprising, but we are gearing up for Wednesday, for our first Yappy Hour (bring your pooch, and enjoy the company of other dog-lovers in our beer garden). My blog posts have become sporadic of late, the excitement of the renovation process and the rush to open up have faded. Now that we're open there is different excitement, but there is also a lot of work, which just occupies my time, and keeps me from sharing with you my experiences. This is why today I decided to note every little thing I do, and a rough time-line. Right now E! and I work at least 16 hours every day. Even on Tuesdays, when we are closed, there is so much to do that we barely have time to sit down together. I get up at 7am and walk the dog. She needs food, like we all do, and she'll get it hours before her daddy. I make coffee (Monkey Joe's Columbian) and have a cup. I pore over last night's receipts, add up, compare, making sure all servers get an equal share of tables and sales. A little after 8am, E! reminds me that I had promised to go to Highland, to pick up sausage at Mark's. I rush into Highland, pace myself, the cops are out there. I pick up Weisswurst and hot dogs, stop by our friend Carol's on the way back to see if she has strawberries. She promises to get them to us later in the morning. Back at home I read the water meter. We have to keep record of our water usage for the health department. While I'm in the basement, I grab some beer and wine to restock the bar supplies (I should let the bartender do this, I always forget that we pay people to do work). 9:30am, I haven't had breakfast yet, but will eat next time I remember. I settle last night's credit card receipts, and make sure the cash register has enough change. Do laundry (aprons, wipe-down towels, which we use a lot of during the course of a day). I briefly discuss ordering more coffee with E!. At 10am I sit down for breakfast, two slices of the finest rye, made by our neighbor Joe Calabrese (he used to own a bakery, and makes some yummy bread). I write checks to employees, tape the switches in the bathrooms, so people don't turn off the lights all the time (we have motion-activated timer switches, which turn on and off automatically). 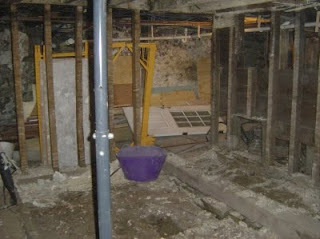 I install protective baskets on the basement lights, which hang rather low, and I have hit them already a few times. 11am our daytime bartender arrives, we open shop. I forgot to put the laundry in the dryer. Have I brushed my teeth yet? No. Will do later. Take the dog out, she has needs, too, and she isn't a happy camper being confined upstairs all day. It's tough being a restaurant dog. Print out lunch menu, pay the delivery guy for produce, rearrange shelving for dry storage in the basement to make space for another shelf. Check on laundry, not dry yet. Noon, bring kitchen scraps to compost (another job for someone we pay, but I'm a do-er, I do stuff). Chat with our neighbor Bill, our first customer of the day. Finally, I remember to brush my teeth. I should drink some water, I only had two cups of coffee so far, I don't want to get dehydrated. Run into town for last minute groceries and supplies, there's always something we are missing. 2pm. I really should drink more water. Am I hungry yet? Let's hold off on that. 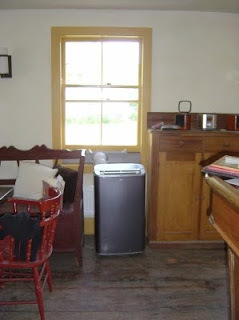 Get the laundry from the dryer, and drop it on the counter in the wait station. The staff will fold it, when they come in (I am learning to let go). Chat with customers, print out more lunch menus (we have a lot of people stop by, asking to take a menu, which of course will have changed by the time they come back for lunch or dinner). Chat with customers. 3pm, lunch time, curry wurst on a pretzel bun, yummeeeeee. Promote the Salmon Strudel on our Facebook page (I feel like a fisherman, trying to lure customers in, and Salmon Strudel is a fine bait). A customer calls to make a reservation, we love reservations, they make it easier to gauge to the traffic for the evening. I respond to comments on Facebook (off-premise customer care is just as important as on-premise customer care). Think about all the things I need to or should do, resulting in a mental overload. Brush it off, everything in due time, baby steps, baby steps. Talk to chef E! about the dinner menu, edit, print, and present the result to E! for proof-reading. Call Monkey Joe's to order more coffee (I should have done that Friday already, baby steps). I catch them just before closing, but they take my order, business is business. Print the dinner menus, respond to email. I need to drink more water. Did I brush my teeth this morning? I haven't talked to my parents for weeks now, no time. I'll call you soon, love you. I change for dinner service (dirty shorts and worn-out t-shirt isn't an acceptable dress code). Notice an error on the menu, reprint, E! notices another error on the menu, reprint again. Kid comes in looking for a job, sorry, line cooks only, and by the way, next time you apply for a job, dress for the occasion, don't circle my entrance with your BMX bike like a fox the hen house, and f'in don't spit all over my walkway. 5:30pm customers arrive. Seat customers, chat with customers, trying to be a good host, making sure customers are attended to. It's a busy night, almost all tables are filled. Seat more customers, take orders, serve beverages, bus tables, run credit cards. 7:30pm we're out of Salmon Strudel, burgers, and the Chocolate, Chocolate, Chocolate dessert. Sodas are running low. Need to make an emergency shopping trip tomorrow. The evening is winding down. I cash out two servers and send them home. Have the last server clean the beer hall and wait station (every server has the honors at least once a week, I try to be a good and fair employer). 9pm a few bar patrons arrive. By 9:30pm the bar is empty again. We're closing down. Going through the day's receipts so I don't have to do it the next morning. Sit down with remaining staff for a beer. Another 16 hour day has come and gone. I had a job once where I was paid good money just to show up (my boss hated me, and didn't give me anything to do). This is much better. Go to bed, start writing this blog post, too tired, will finish tomorrow. Roll over and fall asleep. I think I brushed my teeth. More than a year ago we had Jeff, our master plumberer and air conditionerer, install the grease trap in the dish station. 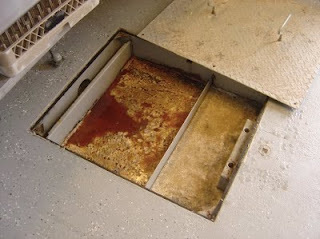 The purpose of the grease trap is to capture oils and grease, and prevent them from getting into the septic system, where over time they would clog the leach field. So they are a good thing, and as a restaurant we are required to have one. Originally, the health department wanted us to install one the size of a VW microbus, for no justifiable reason, other than they said so. 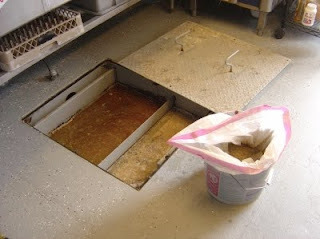 Talking to grease trap manufacturers and internet research didn't provide much help on grease trap sizing, except that dump load (in our case the size of our 3-bay sink) would be a good starting point. Somehow we managed to convince the head-honcho at the health department (who has since been nixed) that a 100 gallon grease trap would be sufficient for our kitchen. Fast forward to today. The grease trap has been in use for more than a year now, but I never looked inside. Until today. We are closed today (it's Tuesday), and it seemed like a good day to do it. Our health inspector (one of the good guys, despite the fact that he works for the health department) had warned us that the odors from the grease trap could trigger gag reflexes, and were beyond sour milk. So I opened the door as a precaution, in case I needed to escape. Fair warning: the following pictures may not be for the faint-hearted. ... and be disappointed. Yes, there was scum (about half inch thick), but the smell was like leaving a greasy pan filled with water sit for a day or two, i.e. harmless. A question I have heard a lot lately, is whether we would play music at Gunk Haus. The short answer is maybe. First of all, we would have to put in a sound system, which is more work, and it costs money. Putting in the sound system, however, is the easy part. I assume you don't know this, but if we were to play music at Gunk Haus, we would have to pay royalties to the music big wigs. You read right, the music industry wants its share when we play (copyrighted) music. For a restaurant our size the annual royalties amount to about $1000 to $2000 per year, which to us is a lot of money (if it isn't to you, please adopt me). The National Restaurant Association has a nice summary document about music licensing for restaurants (PDF document). So for the time being we won't play music at Gunk Haus, and you just have to talk to each other for entertainment, but that's a good thing, isn't it?! The easiest way to judge if people enjoy a restaurant's food is to look at their plates when they are being cleared off the table. So far we rarely have plates return to the kitchen with food on them, which is a good sign. It means that people enjoy the food, and that the portion sizes aren't too big to handle. The credit for all this, of course, goes to E!, who creates and prepares all these yummy dishes. 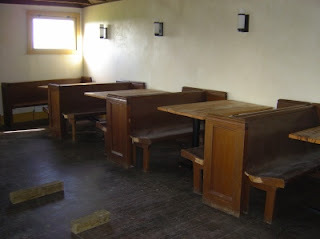 Gunk Haus doesn't have bar stools, and it never will. 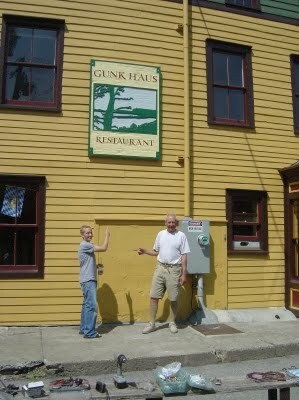 Gunk Haus is a restaurant, which happens to have a bar room. When we applied for our liquor license some two years ago, we sized the bar to accommodate about seven bar stools, and that was the plan until we started looking for bar stools we like. Bar stools, like most chairs, are expensive, which is why we then put off the idea of having bar stools, at least for the time being. But soon we started recognizing that not having stools at the bar isn't such a bad thing. We want Gunk Haus to be family friendly, and in conversation with family we learned that families (ours anyway) are turned off by having to walk through a bar into the dining room. This gave us pause to consider how we could debarify the bar room, and the first thing to go, not that we had them yet anyway, were the bar stools. Our bar should feel more like a living room, and to some extent it is our living room. Aside from this, in German restaurants you rarely find bar stools, or people sitting at a bar, or think of a pub in England, where people stand at the bar (not that I know, because I've never been, but you always see it in the movies, so it must be true ... ;-). Lastly, not having bar stools increases traffic flow in the bar tremendously. What an exciting and tiring weekend. I don't even know where to begin, but this picture says it all: We are open for business!!! Strike 11am on Saturday I flipped the sign to Open and ... nothing happened, until about an hour later when our first customers walked through the door: Shirley and Butch Anson of Clintondale. Both have been staunch supporters of Gunk Haus. Saturday was filled with events. We had dinner reservations for about 40 people, and I sort of got yelled at by E! for not staggering them more carefully. 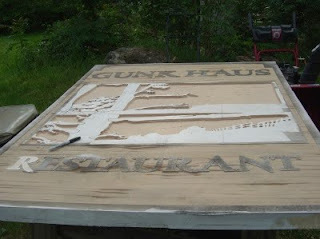 By 7pm the Haus was bustling, there was chatter and laughter, and it felt good to see Gunk Haus alive. Of course there were glitches: The fryer broke, and so we had to take the french fries off the menu. And then there was the A/C which stopped working in the beer hall. Around 4pm I noticed that it was awfully warm in the beer hall. The air handler didn't budge. I tried to fix it temporarily, but without success. So I called the A/C guys, after all, I had a restaurant to run. By 6pm we were back and running, but the beer hall was still too warm, and it would take the A/C the rest of the evening to cool it down again, but no one seemed to mind. My personal superstar of the evening was my beloved wife. E! ran the kitchen like a general, and churned out yummy food like there is no tomorrow. We haven't found a line cook yet, and therefore the burden of the kitchen rests on her shoulders. Yesterday she came running out of the kitchen glowing with pride to show off her first kitchen tattoo: She had taken a rack of pretzels from the oven, and meant to put it on an upper shelf for cooling, when it slipped off her hand and started falling. Determined not to lose the pretzels she caught the hot rack with her upper arm, resulting in a one by three inch burn. Cooks are tough! It was an exciting weekend, and there is so much more to talk about, but I will leave it at this for now. I want to thank our service and kitchen teams for making this opening weekend a success (we have a great team), and of course you, my dear readers, and supporters. we are open for two days now, and let me tell you, it's exhilarating. The days are long and the nights are short, which is why I haven't blogged for the last two days. It is 1am, and I am really tired, but I hope I will be able to report to you tomorrow how things went this weekend. 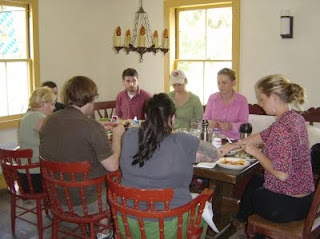 We had all of our staff in today, to go over everything, and try all the food and beer. I think we have great staff. Granted, we'll see tomorrow, but I feel confident they'll work well together. The beer hall, waiting for customers. 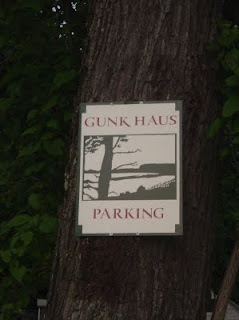 The Gunk Haus logo as parking sign. It's 1am and I am really tired. E! is still in the kitchen. We haven't found a line cook yet, so she has to step up her game tremendously to fill this void; as they say: The show must go on. I just wanted to post real quick that we are extremely busy right now, and therefore I won't read, and thus respond to, email or any other form of electronic communication. If you need to get in touch with us, please call 845-883-0866. 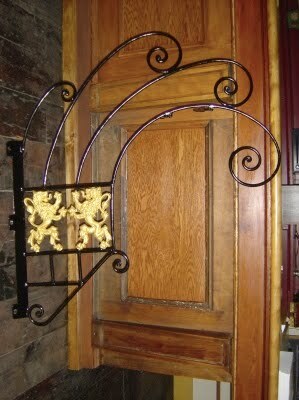 We will throw our doors open Saturday, May 29, all comers taken. We'll be open Saturday through Monday (Memorial Day) at our regular hours (11am - 11pm Sat, 11am - 10pm Sun and Mon). We are closed on Tuesday. Wednesday June 2nd through Monday June 7th, we'll be open for dinner and by reservation only. And starting on Wednesday June 9th we'll be open on our regular schedule (11am - 10pm, Sun, Mon, Wed, Thu; 11am - 11pm, Fri, Sat; we're closed on Tuesdays). We will only have four items on the menu for Memorial Day weekend, and a limited beer selection (I just haven't had time to setup the walk-in cooler, and the tap system). 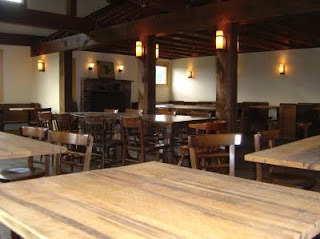 Starting next week, we will slowly add menu items, and take time to train the staff, and after that we are in business. One 12000 BTU portable A/C does not cool the bar room on the hottest of days. Note to self, need to get a second unit (we'll try to squeeze by with portable A/Cs until we have to money to install ductless A/C). 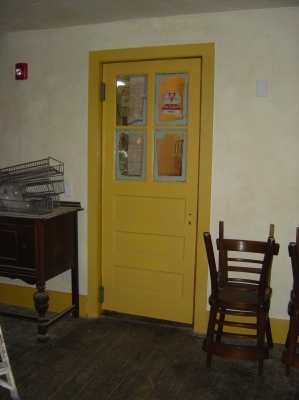 Dutch door to the wait station, newly installed, swings both ways. Ice maker, charged and making ice (very important for a restaurant!). 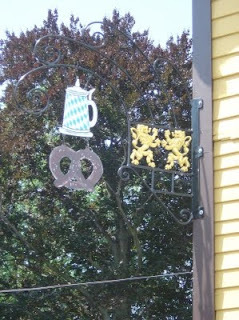 Door to the wait station (from the beer hall), swings both ways. Who wouldn't want to have these guys as there best friends?! 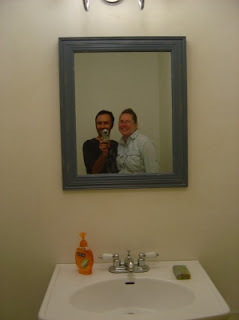 Good food, good beer, good atmosphere (oh, and the mirror is what this picture is all about). The days are getting longer, so I will keep this post brief. It is 11am, and I am only starting to write this post. Too much is going on right now. I was up last night at around 3am cutting mirrors for the bathrooms (in the last seven days I haven't had a single night where I wasn't up for at least two hours). I was largely straightening things up in the Stube (our private dining room), so we could move stuff there from the beer hall. 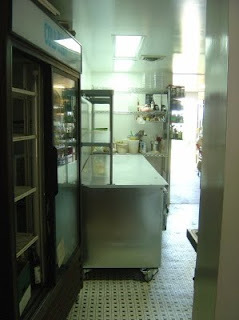 We received our last piece of major equipment for the time being, a counter-high refrigerator, with shelving, for the kitchen. It is quite long and wide, which meant I had to make space to get through the bar and the wait station to get into the kitchen. Jeff was by to put in the new solenoid valve (actually he was by for something else, but he did this instead). Jack was by while I was out, so I don't know what to report, but I'm sure it was something good. My afternoon was filled with talking to our accountants, shopping, and more shopping. And now I'm seriously tired. Good night. Five more days, I think, and still so much to do, although most of it will be cleaning. 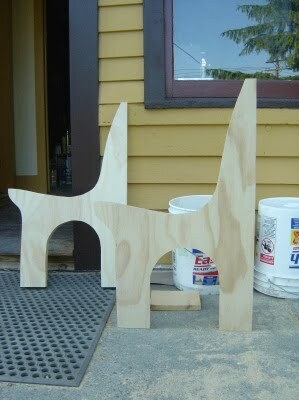 But things are shaping up. I spent most of the day connecting all the phone lines in the bar and kitchen (or at least the ones we need for opening), as well as internet connection (the credit card machine uses the internet instead of a phone line to dial out). Aside from that we hired a waitress, a bartender, and a second dishwasher. E! was busy coordinating with staff regarding scheduling, talking to vendors, and I don't know what. 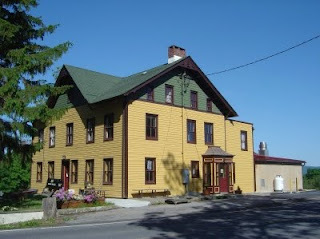 I woke up at 4am this morning and continued working on the Gunk Haus Facebook page, filling in opening hours, address and such, when I noticed that Google Maps does not produce the correct location for our address, off by a good two miles. Mapquest is off by maybe 100 feet, Yahoo Maps by about 500 feet. Unfortunately Facebook uses Google to provide a map link to the address. I had meant to mention it for a while now, but always forget, so I'll make this its own post. We would like Gunk Haus to be a family friendly restaurant, and therefore stock the essential baby changing items in one of the bathrooms (in case you Moms and Dads forgot them at home). The tricky part here is that they don't sell diapers in a multi-size pack, covering size ranges from little munchkin, to starting-to-crawl munchkin, to can-reach-the-TV-remote munchkin, to ... you get the idea. Therefore, if your munchkin moved up the diaper ladder, and you're stuck with a year's supply of diapers that don't fit anymore, drop a few (five or so) off at Gunk Haus, so we can help out other Moms and Dads in need. We are blessed with a great neighborhood and great neighbors. They bring us cookies and muffins, they plow us out in the winter, and they spray-paint our table bases, which is what our neighbors James and Scott did today. It took them two hours start to finish what would have taken me an entire day to do with a brush. And the Jack was back, finishing the banquette in the beer hall. I hate to brag, but this place is looking awesome. 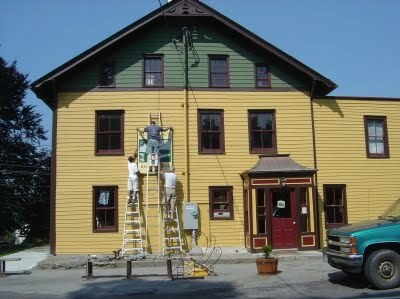 We stopped by our friend Jerry's to have a look at the sign, which will adorn the building fairly soon. My day started out a little after 2am. I had to use the bathroom, when I noticed that the water pressure wasn't particularly high. 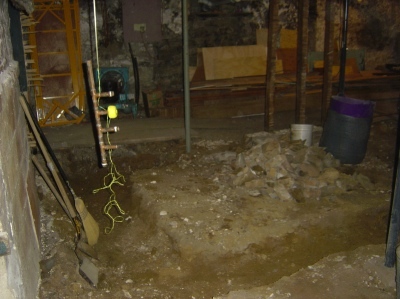 So I ventured into the basement and looked at my water distribution system. There are the usual tasks and tests I perform, on of which is to drain some water from a drain valve past the solenoid valve (the black thingy in the upper right-hand corner in below picture). Normally, the water should be gushing out of that valve, but after an initial gush, it quickly died down to a trickle. Aside from this there was some gurgling noise from the solenoid valve, which to me meant only one thing, the solenoid valve didn't let any water through, i.e. it must be broken. So I spent the next hour to read up on the solenoid valve, how it works and such (well, most time I spent finding information, which is scarce, at best), but at the end I had to admit to myself that we simply need to get a new one. Now that I am looking at the picture below, and re-read what I just wrote, I realize that I should explain really what all these things are that you see. As we are a restaurant and we draw our water from a well (instead of municipal water supply) we are considered public water supply, and therefore have to treat the water to kill (potential) micro-organisms. The choices are either chlorine or UV light. As chlorine makes the water taste like a swimming pool, we had opted for the UV light solution. 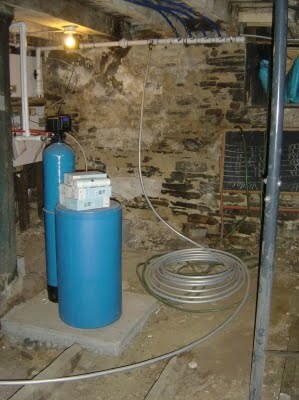 In thew picture you see the UV lamp house in a four foot long steel tube through which the water passes. On top of the tube is a control unit, which measures the UV intensity. Connected to the control is an audible alarm and the solenoid valve. 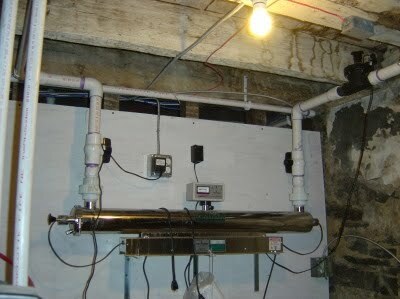 If the UV intensity drops below acceptable standards, the control turns on the alarms, and shuts the solenoid valve off, thereby cutting the water supply to the building. All this means that we were pretty much out of water today. After two or three trips to Lowe's I found the right parts to solve this problem by installing a bypass from the pressure tank to past the solenoid valve. This is only a temporary solution, and we could not open with it. In fact, I believe the health department would shut us down immediately if we were open with this hack. For being Saturday, no supply houses were open, whom I'll call on Monday, and have a new solenoid valve shipped express, because we are determined to open next weekend, by hook or by crook. We interviewed more prospective staff today, and hired a dishwasher on the spot (it is rare to find people who are just enthusiastic about taking on work most people would snub their noses at). Our neighbor James stopped by to help us out with lighting. We are trying to use energy efficient light bulbs as much as possible. Unfortunately the light emitted by CFL light bulbs has a greenish hue (at least against the plaster on our walls). James brought by some color correcting foil, which we tried this evening. It definitely makes the light less green and warmer. For dinner we tried the smoked sausage Mark Elia dropped off yesterday, and it was the bomb, and then we tried it with E! 's homemade curry ketchup, and it was the atomic bomb!!! It was quite the surprise when Mark and his wife Tony stopped by again this evening and dropped of boxes full of wine glasses (we had talked about it yesterday, that we were still in need of some). I cannot tell you how blessed E! and I feel by all the support we have had from the closer and larger community, friends and neighbors. I hope we will be able to give back one day. 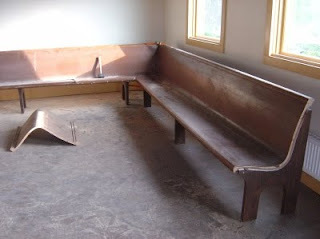 And because so much happens right now, I totally forgot to mention that a few days ago our neighbor Butch Anson stopped by and asked to make a reservation, for Sunday, for after the parade. What parade?! 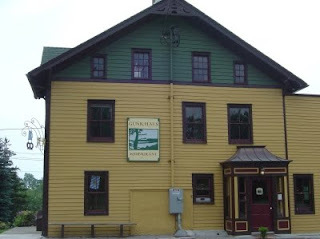 That's when we learned that the town of Plattekill holds its annual Memorial Day Parade in one of its three hamlets, and this year it is in Clintondale, passing Gunk Haus just a block away. Seasoned restaurateurs would be happy about news like that, we, however, are scared as hell. 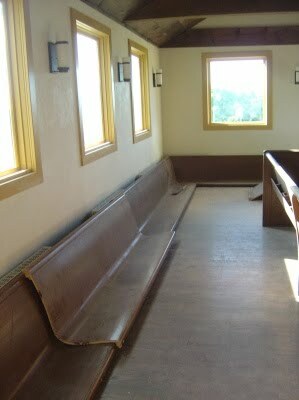 More over, we already have reservations for 16 for Sunday. Gosh, this is really happening!!! PANIC!!! I woke up at 4am this morning, again. Sleep is overrated, so we were told by our neighbor David (owner of The Bakery) the other day, and he's been in business long enough to know. So here I am again at 3am, writing my daily blog post, trying to remember what happened, who came by, who called, what was said and decided, and there is a lot going on right now. 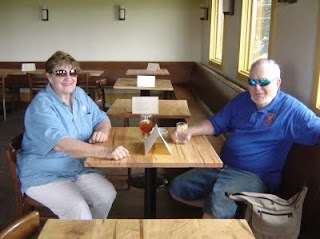 The day started out well, because in the morning Yancey of Whitecliff Winery stopped by. We tried six of their wines, and I have to say, there was not a single wine I didn't like. We will have two or three of their wines on the menu, including the Awosting White. If I weren't so tired, I'd talk a little more about wine, why we decided to go with more expensive local than cheaper imported wine, which could lead to a discussion about how the price of a menu item is determined, and on and on, but as I intend to continue this blog after we are open (famous last words), there'll be plenty of time. Slightly buzzed, it was time to go to work. 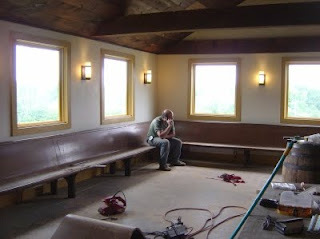 Jack and I worked on the banquette in the beer hall, which is the last major construction we need to do. At the end of the day, the corners were nicely mitered and connected. By Sunday we should have it all done, and then it's cleanup time. In the evening we had Tony and Mark Elia of Elia's Meat Market and Catering over. They brought by samples of Weisswurst and their all-beef smoked sausage, which will be the basis of our curry wurst dish. E! had worked for Mark for a while, back when she was still at the CIA, and he has always been very supportive and helpful. I should take more pictures, these days anyway, so I know what happened that day. We are busy, busy, busy. This morning I remembered I wanted to take a shot of the building. The one I have on my profile still shows Gunk Haus buried in snow. E! meanwhile headed out to get a new mixer, a little bigger than the KitchenAid she's been using thus far. It's a 20 quart Hobart, which is the largest table-top model there is (most likely because it is as heavy as myself, or worse). With all the pretzels we're going to make, we needed a bigger mixer. Speaking of pretzels, one could think that a lot of people read this blog to skim off ideas for their restaurants, at least when you read this article in the New York Times today. A bunch of copy-cats is all I have to say. 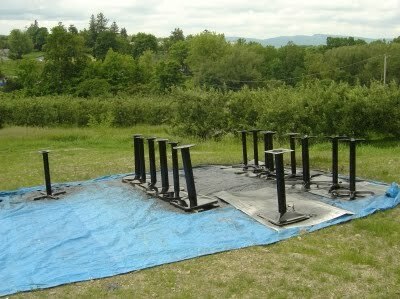 ... and by 9pm we finished staining them. Yes, we were busy. Visits by vendors, beer deliveries that we didn't expect, and sent back, interviews with prospective staff, and I don't know what. As I said, I should take more pictures to jog my memory at the end of the day. Gosh, where do I begin? Our place is starting to turn into a beehive. There is a constant traffic of vendors, and we interviewed more prospective staff. All this of course is somewhat distracting as well. I had meant to do a lot more work today, but was constantly interrupted. Don't get me wrong, it was actually a very satisfying day, even if I didn't get done what I wanted to. I have some good news, and in a second you'll find out why this is good news. We signed up with a credit card processor today. Why would this be good news? Well, only a week ago we were seriously considering opening on a cash basis only. OH MY GOD!! !, I hear you say, DIDN'T YOU READ OUR COMMENTS?!?! Yes, I have, and I can assure you we don't make such decisions lightly, but we were completely frustrated and turned off by dealing with credit card processors, and their perceived secrecy of what fees we would have to pay, and how they come to be. That was until we met Barbara yesterday, who gave us a clear insight on rates, who sets them, and who adds what to the final bill. So, we had her back today, and spilled our (financial) guts. As another positive result of this, we will almost immediately be able to offer gift cards (we already have had a few requests for something like that). Speaking of beer, I will have a post soon about our initial beer selection, and a few other things about our ideas on opening up, and such, and I hope I won't be too tired to do so, because you, as my loyal readers, have all the right to be informed about these things. 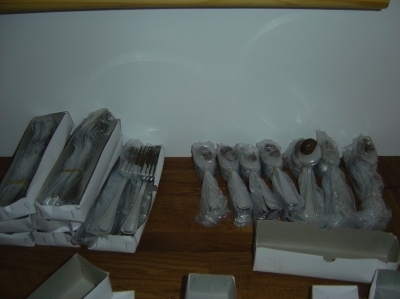 Yesterday was so busy, that I forgot to mention that we got our silverware in. Well, so here you have it. Today was an equally busy day, and I apologize upfront if I forget something. We are getting closer and closer to opening, which means more and more people stop by, vendors mostly, but also prospective staff. The highlight, I want to say, was the visit by a credit card processing representative, and we got the lowdown of credit card processing. I make it sound bad, but it was great education, and we learned a lot. We had prospective service staff over this evening for a group interview, which went pretty well. For most of the day E! was on the phone finding a new dough mixer, because our six-quart KitchenAid crapped out. Now you wonder why we don't just get another KitchenAid. Well, the reason why it crapped out is because it is actually too small for what we need, so E! 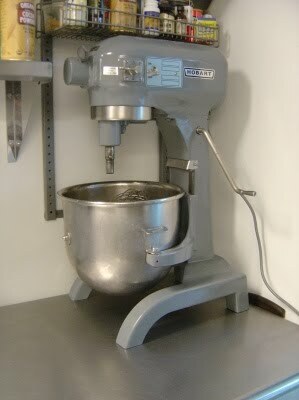 was looking for a commercial dough mixer, clocking in at 20 quarts, which is the largest counter-top mixer you can get. 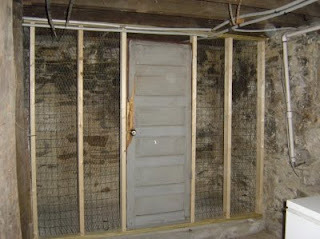 I was busy in the basement building a liquor cage, which we are required to have to lock up the liquor. 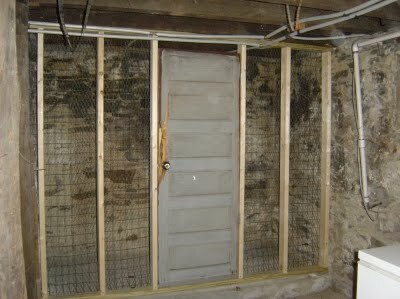 So I framed out a nook in the basement, slapped some chicken-wire and recycled fencing on, installed a door, and called it Fort Knox. 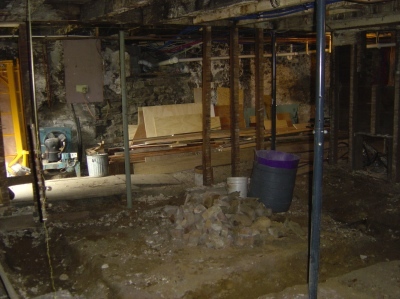 Ever since we had to put this humongous and enormously expensive new septic system in last year (not to speak of the loss of our rental property), I have had a strained relationship with the health department. I admit, I project the negative experience with one health department official onto all others, but why should I be nice and assume they will be, too. Well, there are of course nice people working at the health department, and one of them came by today for our final inspection. We had stressed ourselves quite a bit the last two or so weeks to get things ready for this momentous event. We were all concerned about all these little things that restaurants commonly get dinged for, or things we thought might be an issue. It turned out to be a non-event. We walked through everything, looked at everything, at least casually, and chit-chatted about god and the world, and afterward we got a certificate that showed that we are good (at least from a health perspective) to open a restaurant. Now we really just have to finish this place, and open our doors. But there is still some work that needs to be done. 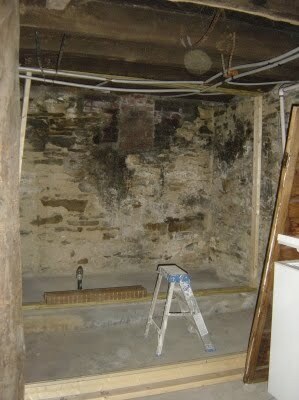 I did some cleanup in the basement for liquor and dry goods storage. 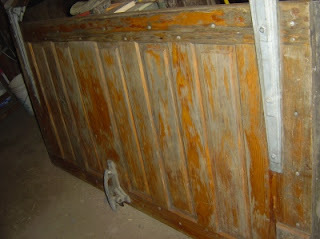 Tomorrow I'll build the liquor cage, hook up a chest freezer, and a few other things that will come up. We interviewed a potential bar tender this evening, and tomorrow we'll have several people over for server positions, and then on Wednesday for line cook position. 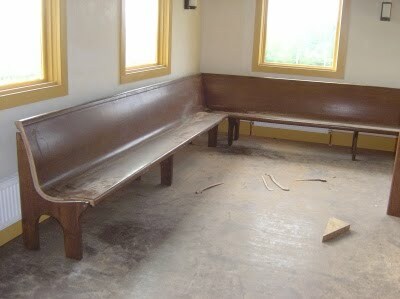 We also started on the banquette on the western side of the beer hall. Hopefully by the end of this week it'll be done.